3 discs are easy to see against the game board. 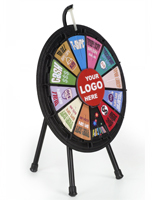 This prize drop game board is ideally meant to be used within a tradeshow or a retailer's exhibit. The gaming display draws in a crowd due to its "plinking" noise and large size. 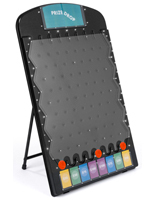 The prize drop game board, also known as a carnival game, works well to supplement a current promotion or to encourage more visitors to enter your facilities. Why not use the gaming system to persuade shoppers to spend more money? For example, the more dollars spent, the more opportunities to play! 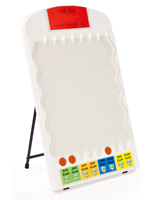 This prize drop game board is derived from the popular American television show, The Price is Right. 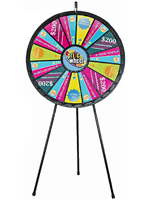 Each contestant is given a flat round disc to drop inside a gaming fixture. 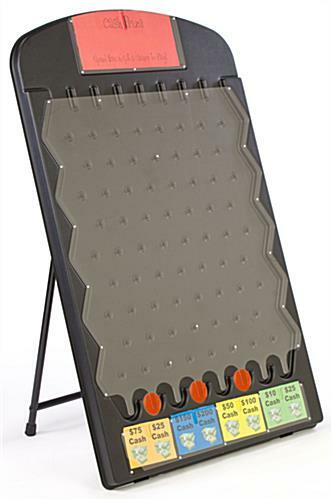 The prize drop game board is equipped with 68 pegs, dispersed throughout the display in an offset design. Once a disc is dropped, it will ricochet against the pegs until landing in one of eight winning prize sections! 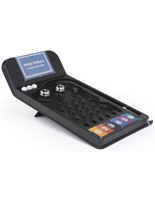 The carnival game is based purely on luck, but has an uncomplicated design anyone will understand. 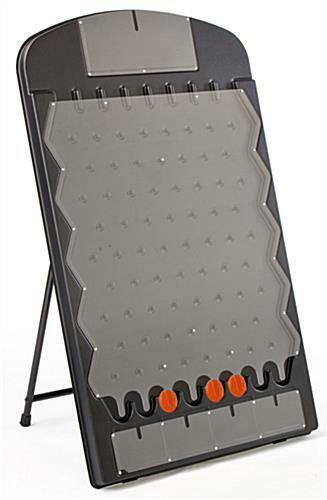 This gaming fixture will be recognized instantly as a sensational activity, everyone will want to play! 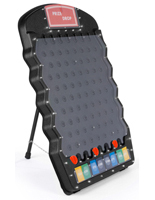 This prize drop game board is constructed from black ABS plastic and includes a powder-coated, steel stand to display on any floor. 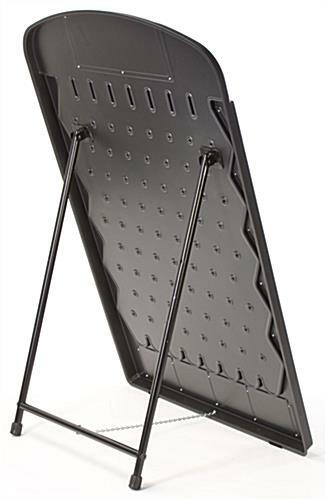 The gaming fixture measures 48" high, therefore making it viewable from far away. 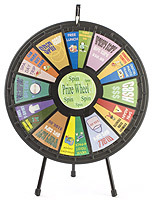 The prize drop game board is sure to gather a group of hopeful participants and spectators! 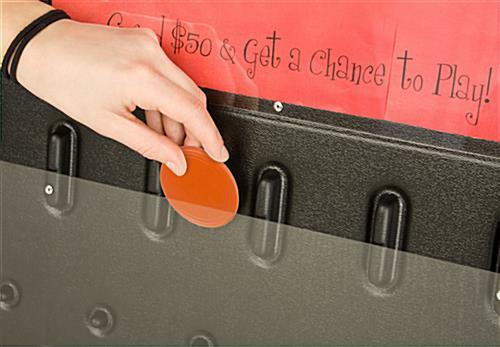 This carnival display is also equipped with templates to help custom design each prize slot and your header. This gives users freedom to personalize every presentation! 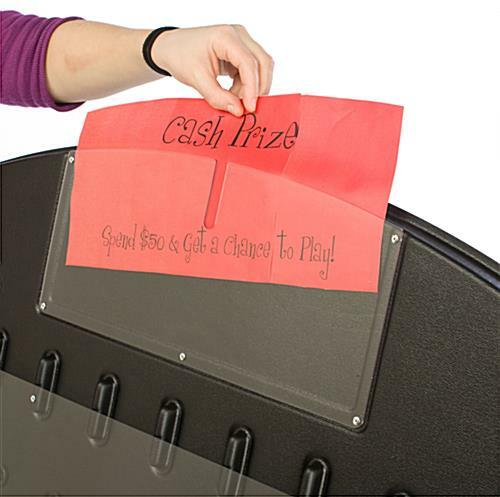 This prize drop gaming display adds entertainment to any situation! Its a good prize drop. The templates are a little hard to use and you will need 11x17 paper for the title insert. The plexiglass is a little flimsy but if it breaks in the future it should be easy to replace. It works great and the kids love it! 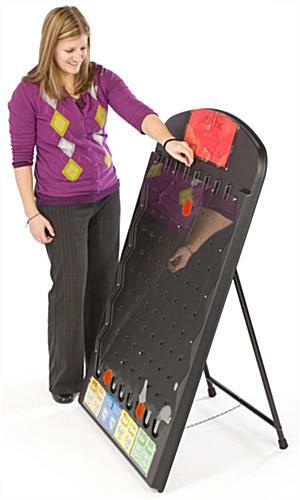 We run regular contests in our call center and were looking for a large, sturdy Plinko board that we could use throughout the year. This piece exceeded our expectations. It's large, sturdy, and we can modify it as needed to match our promotions. I can see us getting tons of use out of this item! Thank you, Tony, for the rave review! We're so excited to hear these work well for you and you'll be shopping with us again! 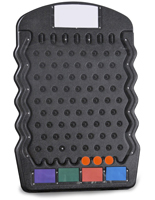 Love the plinko game, and I think it will definitely help attract traffic to our booth at the expo! It's awesome that you can customize it so that we can use it for many different events.